As many of you have already inferred, I am a huge proponent of sunscreen use! I told you about its importance when I first started this venture and my love of Coola products. 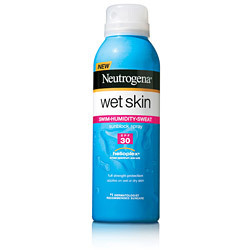 Well, lo and behold, you can imagine my excitement when I read in Women’s Wear Daily that Neutrogena will be launching a new product, Wet Skin Sunblock Spray, starting February (that means tomorrow!) and is available at drugstores nationwide. Unlike any other sunscreen out there, Neutrogena is claiming it has the first-ever waterproof sunblock specifically designed for wet skin application. So, go ahead and jump in the pool or ocean! You can still slather this stuff on and get the sun protection you need. Wet skin is no longer an obstacle! Formulated with Helioplex tehnology to provide broad spectrum sun protection in wet or sweaty conditions, Wet Skin will be available in SPF 30, 50 and 85 for $8.99-$10.99. A total sunscreen game changer and worth every penny!